1000F-Heavy duty sprinkler cart with wheels constructed of 1” heavy gauge steel pipe with solid 1.5″ steel axle for weight and durable “baked on” powder coat finish. Standard with ¾” brass garden hose swivel and commercial grade Sime model “Funny” impact style sprinkler that may be set to a full or part circle pattern with coverages up to 120 feet in diameter!! Sprinkler includes 5 nozzle sizes so you can match sprinkler output to your water supply capability. 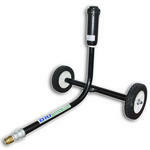 Performance chart may be viewed at bottom of the page ..
Sprinkler stand and hose kits, packaged and ready to ship! 1000F-Heavy duty sprinkler cart with wheels constructed of 1” heavy gauge steel pipe with solid 1.5″ steel axle for weight and durable “baked on” powder coat finish. Standard with ¾” brass garden hose swivel and commercial grade Sime model “Funny” impact style sprinkler that may be set to a full or part circle pattern with coverages up to 120 feet in diameter!! Sprinkler includes 5 nozzle sizes. Performance chart may be viewed at bottom of the page. Includes our heavy Duty 3/4″ x 75 ft. Gilmour garden hose. 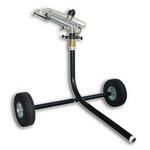 1000R-Our newest addition to the sprinkler cart line with Falcon gear drive rotor sprinkler technology!! The smooth and quiet rotor drive sprinkler features an even water pattern with the gentle “rain curtain” interchangeable nozzles and “leak free” seal to avoid puddling at the sprinkler. Works well at low pressures and is great for horse arenas!! 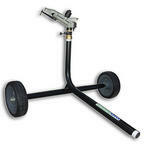 The 1000R heavy duty sprinkler cart with wheels is constructed of 1” heavy gauge steel pipe with solid 1.5″ steel axle for weight and durable “baked on” powder coat finish. 1250K-Heavy duty sprinkler cart with wheels constructed of 1 1/4” heavy gauge steel pipe with solid 1.5″ steel axle for weight and durable “baked on” powder coat finish. Standard with 1 1/4″ standard national pipe threads and commercial grade Sime model “K1″ impact style sprinkler that may be set to a full or part circle pattern. This cart is a very popular choice and a great setup for 10 to 50 gallon per minute flow rates with coverages up to 150 feet in diameter! The 1250K may be adapted to 1″, 1.5″, or 2” supply lines. Full performance chart may be viewed at the bottom of the page. 1250H-Heavy duty sprinkler cart with wheels constructed of 1 1/4” heavy gauge steel pipe with solid 1.5″ steel axle for weight and durable “baked on” powder coat finish. The 1250H features the same body as the 1250K, but utilizes a solid rubber tire with steel rims for added weight and a larger capacity sprinkler head with long and intermediate stream pattern. Standard with 1 1/4″ standard national pipe threads and the large commercial grade Sime model “Hidra” impact style sprinkler that may be set to a full or part circle pattern. 2000S-Heavy duty sprinkler cart with wheels constructed of 2” schedule 40 steel pipe with heavy 3″ square tubing axle and durable powder coat finish. The 2000S features an ATV tow hitch and large floatation pneumatic tires for moving the cart around farms, pastures, etc. Flow ranges for the 2000S can range from 40 gallons per minute to 200 gpm with coverages up to 250 feet in diameter!! Standard with 2″ standard national pipe threads and the large commercial grade Sime model “Senior” impact style sprinkler that may be set to a full or part circle pattern. 3000R-Heavy duty sprinkler cart with wheels constructed of 3” heavy wall steel pipe with durable 3″ square tubing axle and “baked on” powder coat finish. This cart is designed for large scale commercial use for agriculture irrigation, mining dust suppression, truck farm irrigation, golf course irrigation, etc. The 3000R features an pin style tractor tow hitch and large wheel assemblies that are “solid” rubber filled for moving the cart around farms, pastures, etc.